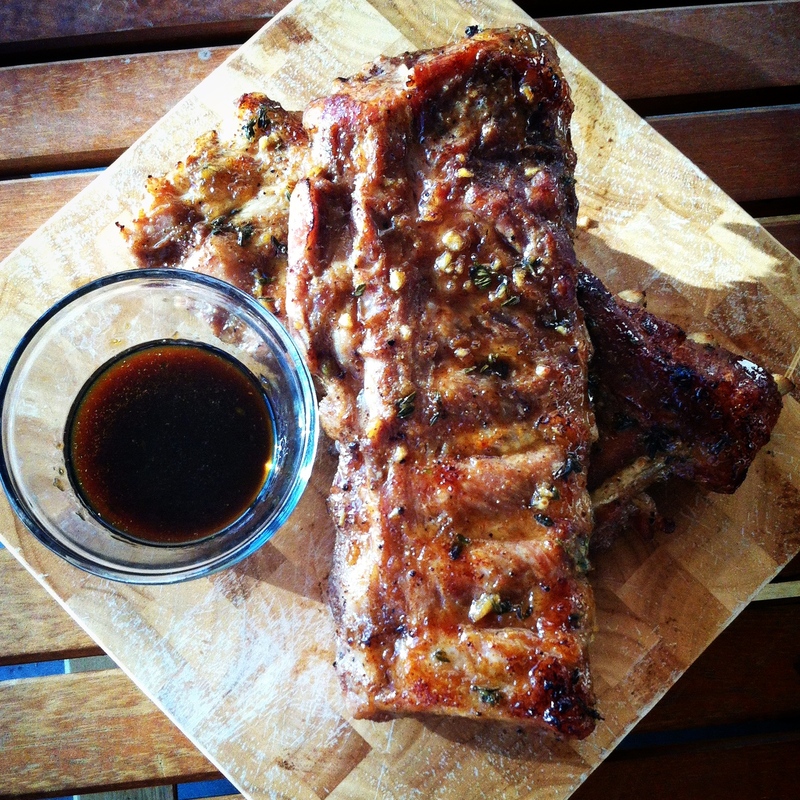 white wine and honey braised ribs | omfg. so good. I don’t know how you celebrate holidays, but at our house they’re pretty much an excuse to eat non-stop from sun-up until sun-down. Father’s Day is no exception. In all honesty, it’s probably one of our more gluttonous days of the year. Jonny has the highest metabolism of any living-creature. Not a scientific fact, but if you ever met him you’d wonder how it’s physically possible for someone who eats that much to be that ‘fit.’ So on his special day we treat him and his metabolism to whatever tickles their fancies. In a small mixing bowl, combine the dry rub ingredients and mix well. Set aside and clean the ribs of the silver skin that runs along the backside of the rack. DIS-GUS-TING job which would normally be pawned off on Baby Daddy. Like George Costanza, I’ve mastered the art of shuffling things around the kitchen and heavy sighing a lot. It makes me look really busy. Any other day I would have pulled this trick out of my hat, but considering it was his ‘special day’ I spared him of the grossness. 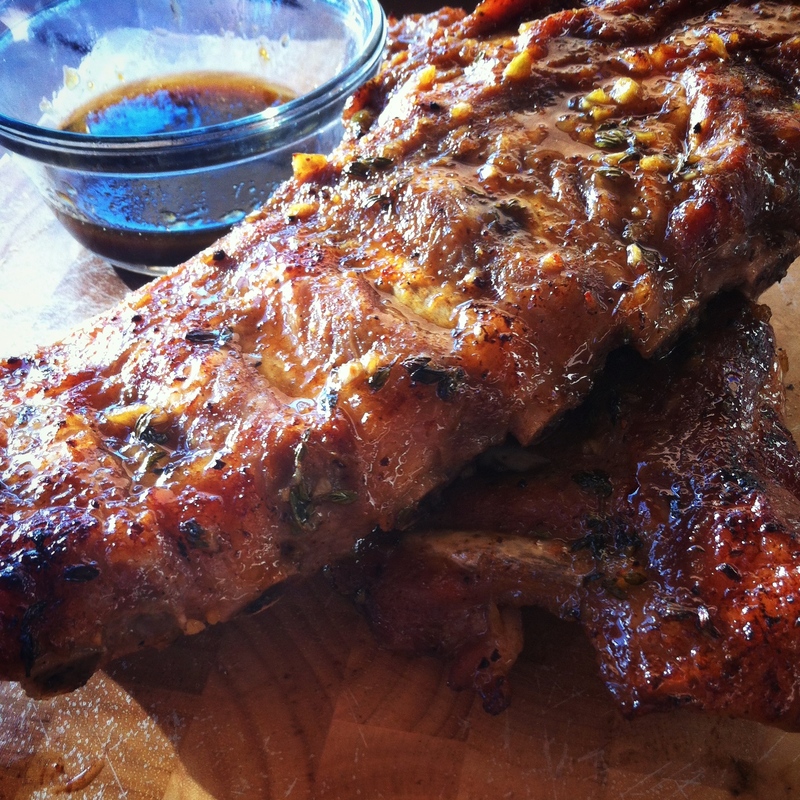 Once the ribs are cleaned, cut them to portion sized slabs and lay flat on large sheets of aluminum foil (large enough to wrap completely and make individual braising pouches.) 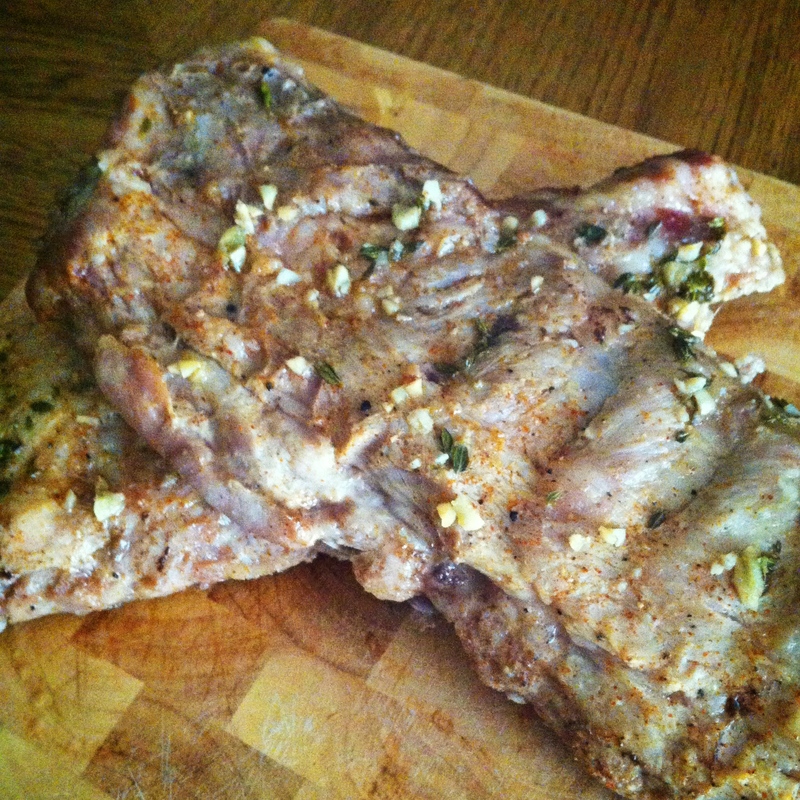 Sprinkle each side generously with dry rub and massage into meat. Before sealing the foil, flip the ribs so they’re meat side down. Tightly seal the pouches and refrigerate on a sheet pan for at least 4 hours. In a microwave safe glass measuring cup, combine the wine, vinegar, honey, worcestershire, garlic and thyme and microwave on high for 2 minutes. Open the rib pouches (just enough to funnel in some liquid) and pour 1/4 of the liquid into each. Seal tightly and place in the preheated oven to cook for 2 hours 45 minutes. Remove the sheet pan from the oven and turn off heat. Pour the liquid from each pouch into a saucepan then seal the rib pouches back up and place the pan back in the oven. The ribs will look pretty boring at this point, I couldn’t even get a good picture of them because they literally blended right into the cutting board and table. But they sure as sh*t smelled pretty heavenly. Remove from the oven and let stand on the sheet pan for around 5 – 10 minutes. Quite a process, but so. frickin. worth. it. Guaranteed to induce meat sweats, but in a good way. I think around 8:00 pm, Jonny may have had three or four more Rolo Blondies. I found Charley hoovering a trail of crumbs from the kitchen to our bedroom the next morning. What a good baby, destroying the evidence for daddy. You should definitely make these. Even if you just want to enjoy the meat sweats all by yourself.